There are many interesting places in Dhaka. It is a modern city of third world with cement-break buildings, in traditional fashion with rapid growing decline. Once ago places of Dhaka was valuable in the south Asia. Dhaka was established in the 4th century by Buddhists, later conquered by Hindus and then by Muslim Mughal rulers in the 13th century. Most of the beautiful places of Dhaka built by Mughal emperor during their regime. Dhaka was established the capital of Bengal in 1608 and then start golden age of the city as a Mughal trading port. The Mughal built Sultan palace, historic mosques, beautiful markets and citadel to safe from foreign powers. Old Dhaka is a place where difficult for you to find your way without a guide. A bustling road with overflows of rickshaw and roadside hawkers, huge working people and passerby make your daily like little hesitate. There are many places of interest in Dhaka as most beautiful tourist spots in every corner of Dhaka city. Last Nawab of Dhaka built a palace named Ahsan Monzil is stand beside the waterfront of river Bariganga. Chotta Katra is the great caravanserai Place of Dhaka. The most interesting Muslim places for worship is Istara Mosque situated in the old Town. Armenian Church is one of the large community for Armenian place & Greek build in the 18th century. British established their colony in Dhaka of what now became the Old Town. Prestigious government building and bungalows across the avenues of places of Dhaka became trade hub of the Bengal province to conduct business from row commodities like jute, sugar, tea & indigo plantation, etc. Ramna place of Dhaka is reflection of British colonial structure with Greek columns and whitewashed facades. It is sign of artistic & intellectual heart of the nation where libraries, college, galleries and National Museum are situated. Lalbagh Fort : This place was the Fort of Emperor Aurangabad famously known as Lalbagh Fort which was established in the year 1678 by Prince Mohammad Azam, who was the son of Aurangazeb who was the then Viceroy of Bangal. New attraction of the place is the Cultural Ministry of Bangladesh took initiatives to make a documentary on Lalbagh Port and showing with laser effect in the evening since 2014. Suhrawardy Uddyan : It is a popular park of the Dhaka city and formerly known as the Race Course maidan. 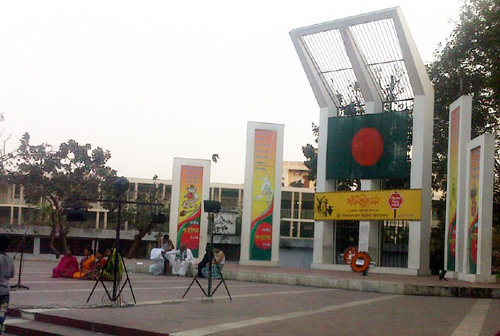 This is the place where the great leader Bangabandhu deliver his historic speech on March 7 in 1971. Shishu Park : Shishu Park is the place of the Child Education and Recreation , popularly known as Shishu Park is also situated in a comer of Suhrawardy Uddyan, Shahbagh of Dhaka. Shishu Park is one of the attractive places for children. National Assembly building : Bangladesh Parliament building is one of the beautiful places in Dhaka. National Assembly Complex in Sher-e-Bangla Nagar was designed by the famous architect Louis Kahn has distinctive architectural features. Natural scenery of this place is very beautiful. There is a green garden beautiful place near Assembly building named Chandrima Uddayn or Zia Uddayan is situated at the northside of Parliament Building where the grave yard of former president Ziaur Rahman also one of the visiting places in Dhaka. Mirpur Zoo: Zoological Garden of Bangladesh is called Mirpur Zoo in Dhaka. Zoo also one of the attractive places to Children and new comer to Dhaka as they wish to visit Dhaka zoo frequently to see birds and animals. This place is situated at Mirpur, 10 kilometer to northwest of Dhaka, on 230 acres of land. Tourist can see life of wild and domestic animals from very near. It is the biggest Zoo in Bangladesh. Shahid Minar: Language Martyrs monument place is near Dhaka Medical College. 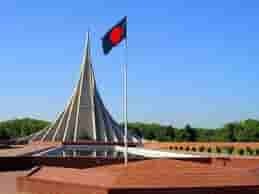 It is the Symbol of Bangladesh nationalism, was built to commemorate the martyrs of historic Language Movement of 1952. Bangladeshi People get inspiration from this place and sometime different organizations raise their voice against discrimination or other unlawful steps. Botanical Garden: The green garden place built over an area of 205 acres of land at Mirpur, near Mirpur Zoo. The place is useful for botanical education, research, preservation of plants as well as recreation with the touch of green nature. Visiting the garden place tourists feel natural atmosphere, follow the path and go deep of the garden and sit beside the lake and playing the green leaves with pleasant. National Poet Kazi Nazrul Islam Graveyard : Kazi Nazrul Islam is the national poet of Bangladesh died on August 28, 1976 & was laid to rest here, near public library and adjacent to the Mosque of Dhaka University. 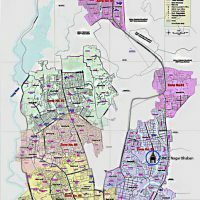 Bangabhaban: The official residence of the President of People’s Republic of Bangladesh is situated near Dilkusha and Motijheel commercial area and east side of Golistan and adjacent to Tikatuly. Any Tourists can have a look outside view of Bangabhaban only. This is only restrict place in Dhaka where general people can not visit. Ahsan Manzil Museum: The Museum is located on the bank of river Buriganga in old Dhaka. The face of the Ahsan Monzil is to south to the River. This place is a model of the nations’ rich artistic heritage. Actually it was the home of the Nawab of Dhaka and a silent witness to many historical events. Ahsan Monzil is one of the historical places in Bangladesh. New look Ahsan Manzil is a monument of immense historical beauty. It has total 31 rooms with a huge dome atop which can be seen from miles around. It now has 23 galleries in 31 rooms displaying portraits, furniture and household articles and utensils used by the Nawab family. National Museum: The National Museum is a place where contains a large number of interesting collections for historical, traditional including sculptures, coins, paintings and inscriptions. All symbols of our great nation are stored here in original style scientifically. Bahadur Shah Park: It also called 1857 Memorial. 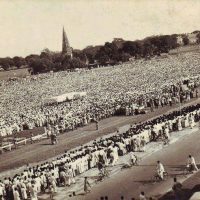 This place was built to honor the martyrs of the first liberation war during 1857 to 1859 against British rule, it was here that the revolting sepoys & their civil compatriots were publicly hanged. Ramna Park: As the Dhaka city become place of vast population. If you look around you will see high raises building only but Ramna Park is a vast stretch of green ground surrounded by a serpentine lake where people can take fresh breath. National Art Gallery: National art Gallery is situated in the Shilpakala Academy building where it has a representative collection of folk art & paintings by renowned artists of Bangladesh. Baldha Garden: Balda Garden is a beautiful garden in Dhaka. The garden is located in the wari area of old Dhaka. Teenager likes this place very much for dating, also locally known as love place. Balda garden is small in size but it has great history as Rabindra Nath Tagore was visited Banlda Garden. Baldha Garden has rare collection of botanical plants and flowers. Baitul Mukarram: The National Mosque in the down town area is the precursor of a number of noticeably beautiful modern mosques. It is modelled after the rectangular shape of the holy Kaaba in Mokkah. Mosque: Dhaka is the city of Mosques. There are more than 1000 mosques are in Dhaka city. Pre-Mughal era Mosque is Binat Bibi was established in 1457 situated in Narinda of Sutrapur, Dhaka. Sultanate period monuments and the single dome Goaldi Mosque was established during 1493 – 1519 and Fateh Shah Mosque was established in 1484 situated in Mograpara. The most primitive Mughal memorial in Dhaka is the Eidgah, an open field for Eid prayers, located in Dhanmondi area. The most architecture mosque of Moghal was established in 17th Centure which was three-domed sat gombuj mosque as shown seven domed, thats why it is called seven domed or sat gombuj mosque. It is situated in Mohammadpur. Another 3 domed mosque build in the year 1679 situated behind the old High Court Building. The Chowk Jame mosque was established in 1976 situated in Chalk Bazar of Dhaka. It was the best know mosque in the city where people were visited from different areas. Another historical mosque is situated in Armanitola is Petite Star Mosque which was established in early 18 th century that made of broken pieces of China. Churches: Armmanian Church was established in the year 1781. St. Mary’s Cathedral at Ramna. Church of Bangladesh or former St. Thomas Cathedral established in 1677 at Tejgaon. River Cruise: During the dry winter months river cruise is available. The cruise provide an opportunity to have glimpse of riverine Bangladesh and its lash green countryside. Bangladesh Parjatan Corporation (BPC), the national tourism organization and The Guide, a private tour operator runs regular city sightseeing tours and river cruise. 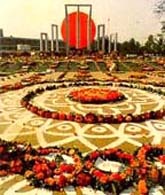 National Memorial: National Memorial of Bangladesh is located at Savar. National monument was built to commemorate the martyrs of the war of independence of Bangladesh in 1971, Jahangirnagar University and its sprawling campus is also located nearby the place. National Park: The Park is situated at Rajendrapur, about 40 kilometer from Dhaka within Joydevpur police station in the magnificent Bhawal region on Dhaka-Trishal-Mymensingh Highway, This place is a vast of 1,600 acres national recreational forest, ideal for those who love nature. Sonargaon: Sonargaon is the famous palce for Folk Art Museum is located about 29 kilometers from Dhaka which was oldest capital of Bengal. Deva dynasty was settled here until 13 th century. From this period onward till the time of the advent of the Mughals Sonargaon was a subsidiary capital of the Sultanate of Bengal. Wildlife Sanctuary : Madhupur is about 128 km. from Dhaka , an interesting wildlife and game sanctuary of the country. Tourist places in Dhaka and Dhaka historical place make beautiful city of Bangladesh. 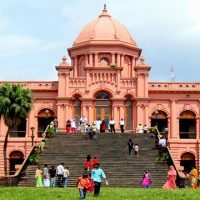 Dhaka sightseeing places are most tourist attraction in Dhaka that people visit with friends and family. 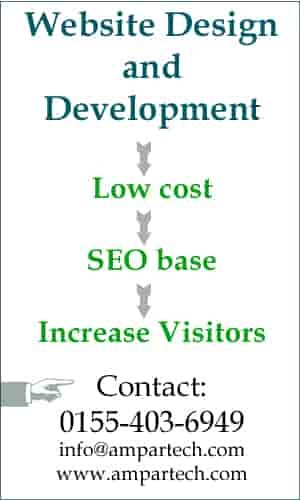 Dhaka city points of interest are different from people to people. Few people like to visit Zoo, others like museums or Dhaka historical place. Ahsan Monzil is one of the famous places to visit in Dhaka. Its existence makes Dhaka tourism very rich. Places to visit near Dhaka are Tajmahal in Sonargaon, National park or film shooting spot in Gazipur, National monument in Savar, etc. Sonargaon is one of the Historical places situated near Dhaka. Modern Dhaka tourist attractions also are amusement park like Fantasy Kingdom. Dhaka tourist spots National Assembly building and Chandrima Uddayan in Sher e Banglanagar of Dhaka. Lalbagh port is one of the most beautiful place in Dhaka where lies history 16th century. Suhrawardy Uddyan is a historical speech place in Dhaka. Teen ager used to visit Dhaka points of interest as dating places in Dhaka. These Dhaka visiting place also using as dating place in Dhaka. Baldha Garden is one of the dating places in Dhaka.